Suktara 1400, Shraban (July 1993) Bangla Magazine in PDF File. 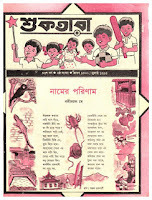 Suktara is a popular children's monthly magazine from Kolkata in India. Famous Bengali comics like Batul the great, Hada Voda published in this magazine. In West Bengal not only famous among children but also equally popular among teenager readers.